A growing issue — once a matter rarely discussed — is that many U.S. households are suffering from food insecurities and neighborhoods are plagued with lack of access to healthy and affordable foods. These neighborhoods are known as food deserts. Instead of supermarkets and grocery stores, these communities may be served only by fast-food restaurants and convenience stores. The lack of access contributes to a poor diet and can lead to higher levels of obesity and other diet-related diseases, such as diabetes and heart disease. According to Feeding America, in 2014, 48.1 million Americans lived in food insecure households, including 32.8 million adults and 15.3 million children. To help solve the problem, Jeremy Goss, a Saint Louis University medical student, and Washington University graduates Colin Dowling and Tej Azad founded The St. Louis Metro Market. The organization is a 501(c)3 nonprofit mobile farmers’ market that is restoring access to healthy, affordable food to St. Louis food deserts. It launched trials late in 2015, and is now operating in certain neighborhoods. 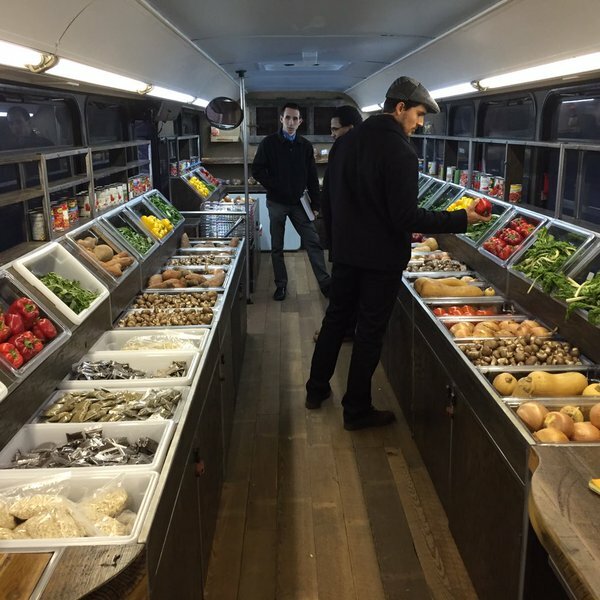 The colorful bus has fresh and affordable produce, meat and staple goods and will advocate on the behalf of these communities on issues related to food justice, hunger and health. Shoppers can find volunteers who will offer information on food and nutrition outside the bus. In order to shop, a Fresh Pass membership can be purchased. In a proactive approach, The St. Louis Metro Market organizers set up a way for people enrolled in the federal food stamp program in specific neighborhoods to be preregistered for a free membership. This will allow shoppers to purchase food at up to 40 percent off retail prices. For those who live just above the poverty line in food deserts, a membership is required. But they will see discounts. If shoppers do not have a membership, they can pay cash for groceries at the unsubsidized price. The cost of a Fresh Pass membership is $150.